I hoped the wind might die down overnight but if anything it got stronger and again kept me up by constantly rippling through canvas. At least Friday had mostly been quite sunny but I got up at about six o'clock to find an overcast and rainy Saturday morning awaiting. After breakfast I packed up, hopped on the bike and rode on into the windy drizzle. I took it a small bite at a time, allowing myself a stop after every mile and constantly counting down to the next junction or landmark. The day was grey and the landscape quite flat (which is why I don't have any pictures to post for that portion of the journey) The wind picked up an easterly component for a while as I neared Eriskay, which presented a new problem with sidewinds potentially blowing me into the path of other traffic on the single-track road. I would occasionally swerve intentionally as they approached, to alert them of the risk. Eriskay came into sight, the connecting causeway a grey ribbon of stone and tarmac across the sea. For a moment the road looped northwards and I had a brief sweet reminder of what it was like to have the wind at your back. The causeway wasn't as bad as it could have been, the stone walls at the edge taking away some of the wind's impact. The road leading off it was a bland grey strip of uphill and headwind, and I got off to use my magic 24-inch gear. I caught sight of a fluorescent yellow dot ahead on the left side of the road and wondered whether it was another insane cyclist heading south, but when I caught up it turned out to be a man on foot. Eriskay was both hilly and exposed to strong gusts of wind but I finally made it to the ferry port and spent a blissful wind-free hour in the waiting room chatting up two middle aged ladies on a walking trip, who were coming the other way and waiting for a bus. The ferry ride was pretty extreme. We headed southwards to begin with, hitting huge west-bound waves at an angle, tossing the ship into the air and smashing it back down onto the sea's surface, triggering car alarms and sending spray high into the air. We passengers exchanged nervous looks while the crew strolled around without a care in the world, assuring us this was nothing unusual. 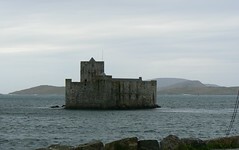 They were probably right, the boat turned to the west and, with the sea on our side, we carried on more calmly to Barra. The road around Barra is circular, and I had to get from the north to the south end, giving me a choice between the east or west coast. Apparently the west is a bit more scenic but on a day like Saturday I didn't think that would matter much - number one priority was to be more sheltered. I was advised that the east coast is more rocky and therefore a bit less exposed, and also a bit shorter, so decided on that. This partially worked, some bits were sheltered and others very exposed. Towards the end there was one more huge climb for which I got off and pushed, before an equally enormous descent took me down to Castlebay. I stayed at the hostel, everything clean and quite modern. The hostel was quite busy and I shared a dorm with Maireadh, an Irish lady also cycling alone (again, northbound). She told me she was married with two kids, worked for the tax office in Dublin and liked to get away on her own on the bike a couple of weeks each year. The weather was still horrible when I went to sleep that night, but I was relieved to be indoors, having completed my southbound journey. I was leaving the Outer Hebrides the next morning, which meant a change of direction and hopefully a change of weather.